Rush Limbaugh stated emphatically last week that “Real men aren’t liberal. And real men, real men, don’t vote for liberals.” Rush, once again, hits the nail on the head. And here’s why. Real men have an innate sense of self that is not dependent on group approval. They have not succumbed to the sanitized, homogenized, and feminized version of manhood that the academic, media, and political elite have adopted. Instead, they have the courage to form their own opinions, relying on independent thinking instead of political correctness. 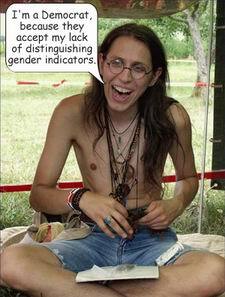 Liberal males, on the other hand, have taken the much easier path of allowing a group identity to define who they are. They have willingly adopted the leftists’ focus on feelings and emotions when confronted with immutable facts, thus allowing them the ability to retain the all-important moral high ground when those facts prove inconvenient. Liberal males allow the left to define the issues and set the rules. These rules allow them to claim morality, compassion, and virtue the easy way – by voting to spend someone else’s money on whomever the left designates as the latest “victim” group. As an added bonus, liberal males are allowed to define their own reality, under the guise of “empowerment.” They are not held accountable when the policies they vote for fail. They are judged on intentions instead of outcomes. Real men have chosen the harder path of relying on themselves to provide for themselves and their families. They have learned through experience that relying on government is a losing proposition. They know what liberal males don’t – that government is the source of their problems, not the solution. And they vote accordingly. Liberal males have chosen to follow the rule of man instead of the rule of God because, as Russian novelist Feodor Dostoyevsky once said: “If there is no God, everything is permitted.” Real men choose to follow the rule of God. Guess which path is easier? Liberal males have adopted the leftist notion that they are more “evolved” than Joe-Six Pack and Susy Homemaker. They have been told that they have a lock on moral superiority and compassion. They are free to focus on rights while ignoring responsibilities. After all, that is what Uncle Sam is for. Right? Real men know that their role is to provide for their families and protect their country. If they fail, they take responsibility. Liberal males, however, have succumbed to comforting group-think that assigns no blame (except to conservatives) for failure. Whew! They have bought into the liberal fantasy that men and women are equal and alike, that all cultures are equal, and that nothing is ever their fault. And they will consistently vote for any politician who validates this concept for them. Real men don’t vote for liberals. Real men, when facing a problem, solve it. They don’t form a commission to investigate. Real men accept reality and work to improve it. Liberal males seek to merely redefine it. Try this simple exercise: Picture President Obama as a grunt on the front lines of a battle in Afghanistan, shooting at the enemy, and fighting for America. That image doesn’t compute, does it? In a nutshell, this is the difference between liberal males and real men. Real men know that terrorists threaten our very existence. Liberal males choose to believe they are merely misunderstood victims of America’s excesses. Real men know that feelings count for zilch when faced with evil. Liberal males have bought into the notion that real evil exists only on the right. Real men have actually earned the self-esteem the left believes is their exclusive right to bestow. By their very actions, real men expose the fallacy of liberalism. Throughout history, real men like Ronald Reagan, Winston Churchill and George Patton have come to the rescue when liberal’s touchy feeley “Can’t we all just get along?” policies have failed. For this, they have been roundly denounced by the left. What was their sin? They were right. Just as Rush Limbaugh was right when he claimed that real men aren’t liberal. I have only one bone to pick, and that involves use of the word “liberal.” It has become divorced from its historical context to the point that it is meaningless. Dan’s right. “Leftist” would be a much better word to use, and the description would be more accurate. There are a lot of men who consider themselves liberal — or at least moderately so, myself included — who don’t fit the stereotype you’ve outlined. Aside from that, great article! Hogwash! Real men don’t have to go around beating their chests and dragging women off by their hair. Real men are great fathers,good people,God fearing or not,compassionate,but not weepy. It does not make a darn bit of difference, what their politics,or religion are,real men are just that,real men. I doubt if you’d notice one,Nancy,as he might be a gardner or a construction worker,or even an artist. Maybe,just maybe, a lefty,too. I have known real men,and you don’t judge that quality,by their politics,not by a long shot. Ah well, Douglas Adams in Hitchhiker’s Guide to the Galaxy looked back to the good old days when men were real men, women were real women and green furry creatures from Alpha Centauri were real green furry creatures from Alpha Centauri. Alas, those day may be gone forever. Thanks for letting us know that there is more to the notion of real men don’t each quiche! Great article. I believe the reason for this is because we do not agree anymore on even the most basic principles. As you allude to in your article, individualism v. collectivism is not merely a political issue; at its heart, the true question it poses is whether you are willing to take responsibility for your own life. That is a very personal decision, not merely a political one, and the answer shapes your deepest philosophical beliefs, not only your political opinions. Real women don’t allow others to define them, either.